The holidays are one of the busiest times of the year for Chinese restaurants, so booking a reservation for your family get together is as essential as ordering pork fried rice. 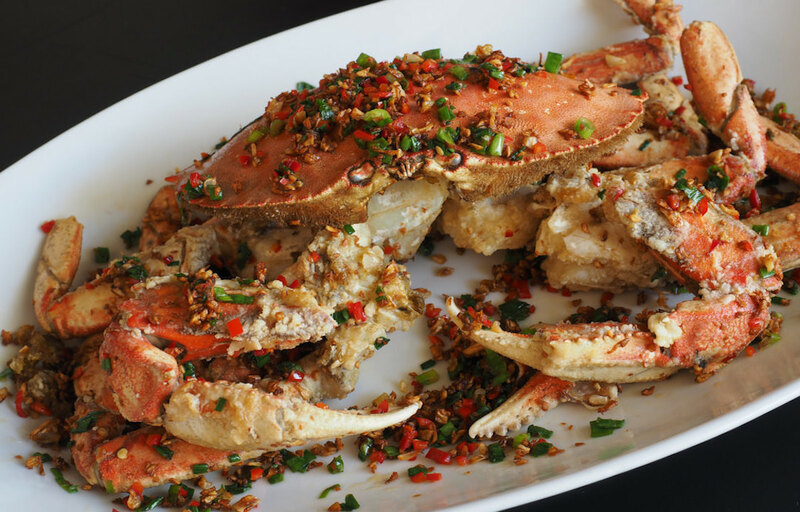 Whether you prefer crab rangoons or General Tso’s, and whatever you’re celebrating, these eight Chinese restaurants will hit the spot. 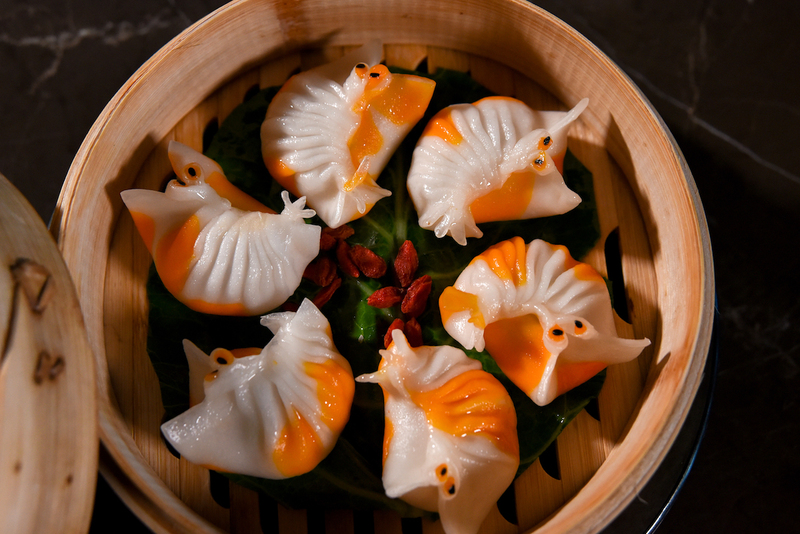 This modern eatery is one of the most highly-acclaimed Chinese restaurants in the Bay Area. Score a seat at the first floor Market Restaurant and chow down on some chow mein. For a more intimate family dining experience, book one of eight tables by George Chen and experience a lavish tasting menu. Make a reservation at China Live. Just outside Boston is a Chinese food mecca open until 2AM on both Christmas Eve and Christmas Day. Take the T (Boston’s subway) for a NO MSG dining experience using only fresh ingredients cooked to order. Their modern, elegant dining room is an ideal setting to binge on their insanely extensive menu. Make a reservation at Golden Temple. Tucked inside the Fontainebleau Resort, Hakkasan is serving up Cantonese cuisine against a backdrop of chic ambiance. The stunning dining room and a large assortment of menu items make this the perfect place for a gathering on Christmas Eve or Christmas Day. 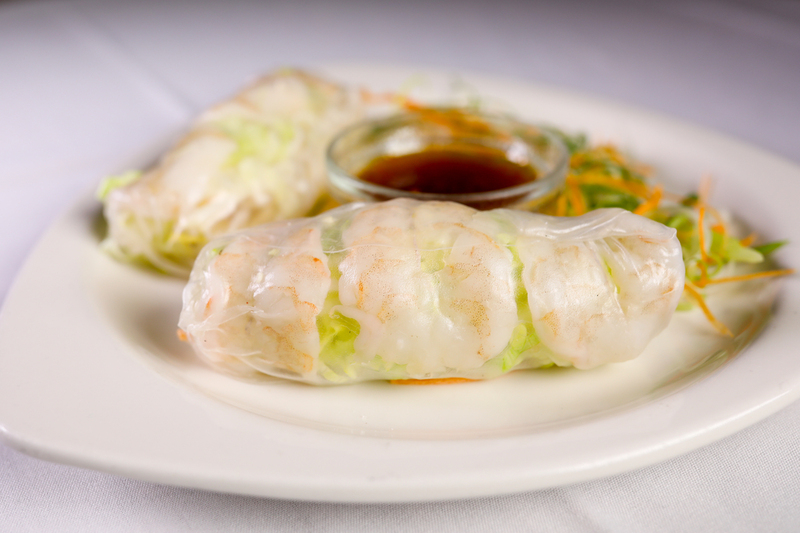 “With holiday offerings such as dim sum, Peking duck, wok-baked lobster, and a wide range of craft cocktails — it is truly the best Cantonese dining experience in Miami,” says chef Thomas Connell. Make a reservation at Hakkasan. 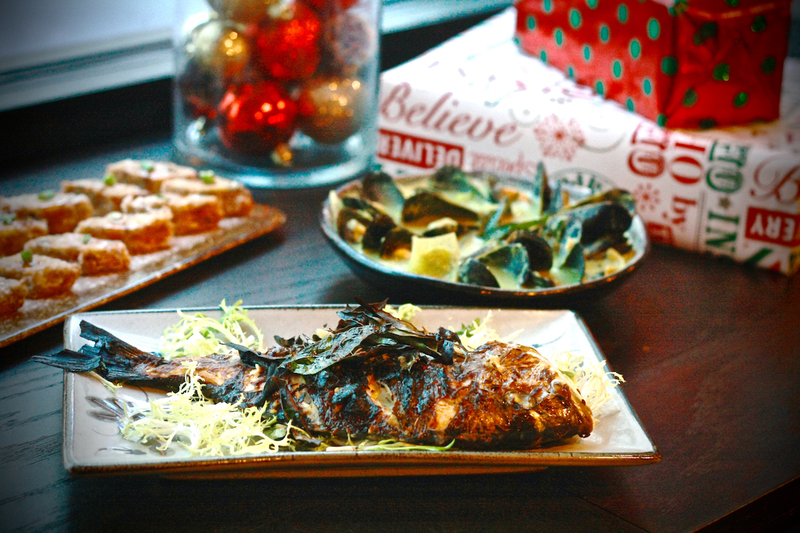 This North River neighborhood spot is dishing out a special holiday menu. Bring the whole family and feast on specials like PEI mussels with green curry, cumin-scented dorade, and tofu cake with ground pork. They’ll also have plenty of holiday-themed signature cocktails to toast with. The menu will debut on Christmas Eve through the New Year. 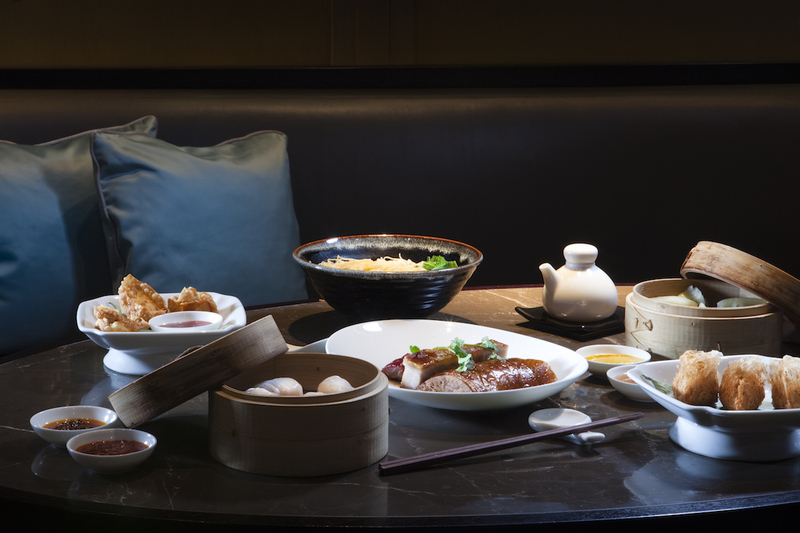 Make a reservation at Imperial Lamian. 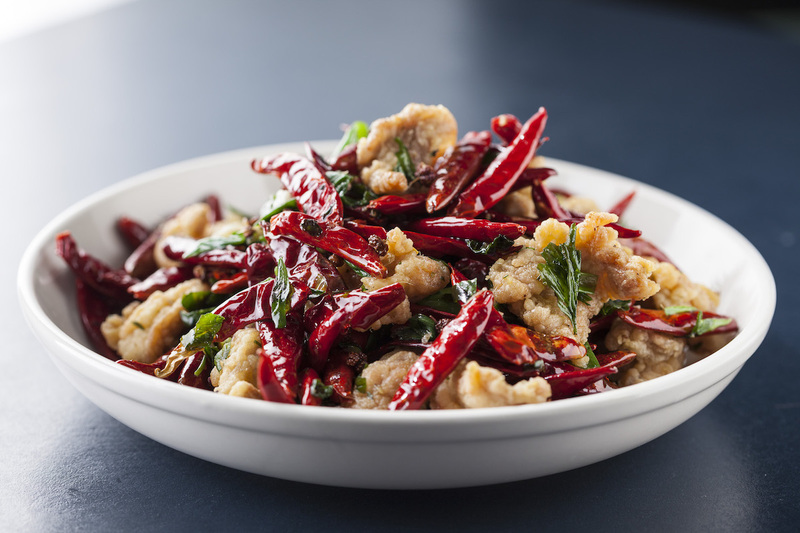 Known for its flavor complexities, Sichuan cooking is becoming more and more popular in the US. Come for the bao and stay for the chili cumin beef. Pro tip: this place is not for the those averse to a chili or two. Make a reservation at Lionhead. Want more holiday treat options besides figgy pudding, gingerbread houses, and sugar plums? These 11 peppermint desserts will be dancing in your head long into the new year. The newly opened Caribbean Room in the Pontchartrain Hotel is the perfect place for a holiday meal followed by dessert. This pie has a black cookie crust, peppermint, and chocolate and vanilla ice cream topped with meringue and chocolate sauce served tableside. Make a reservation at Caribbean Room at The Pontchartrain Hotel. For when you need a little something seasonally sweet. 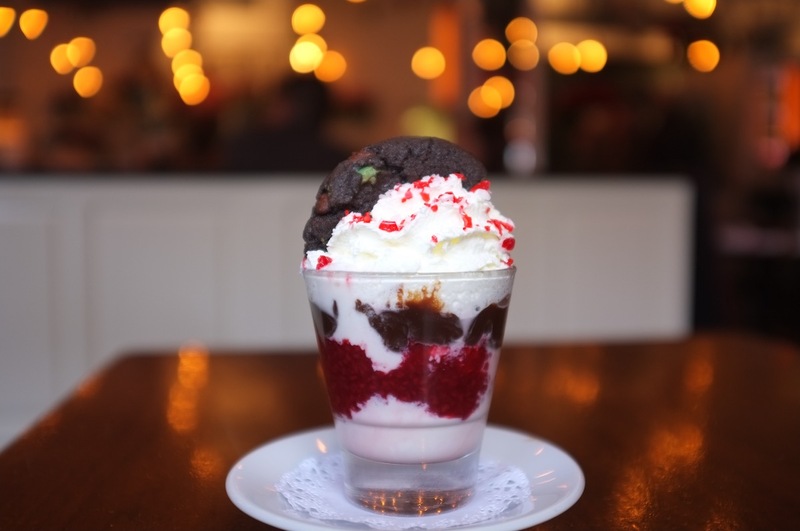 This holiday treat is filled to the brim with peppermint ice cream, raspberry compote, hot fudge, and whipped cream. Make a reservation at 5 Napkin Burger. A riff on classic peppermint bark in cheesecake form. 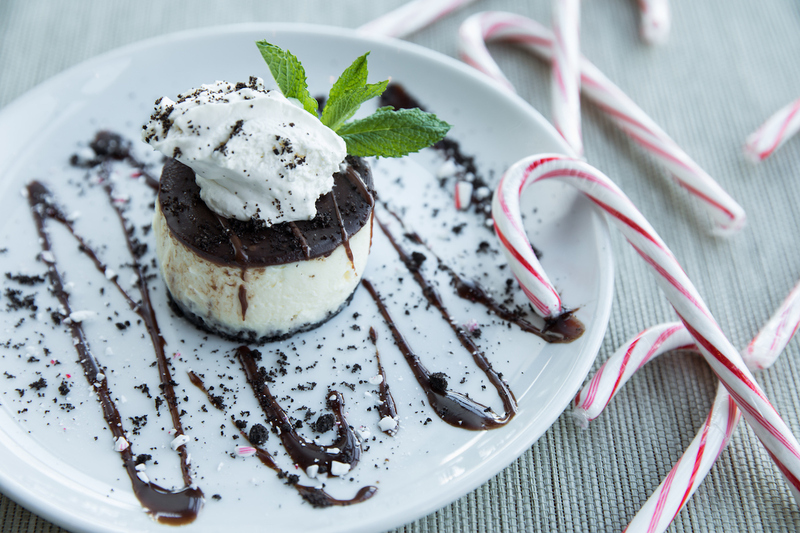 It starts off with an Oreo cookie crust followed by homemade peppermint cheesecake and chocolate ganache and it’s topped with chocolate drizzle, whipped cream, and crushed candy canes. Make a reservation at Big Bowl-Ohio. 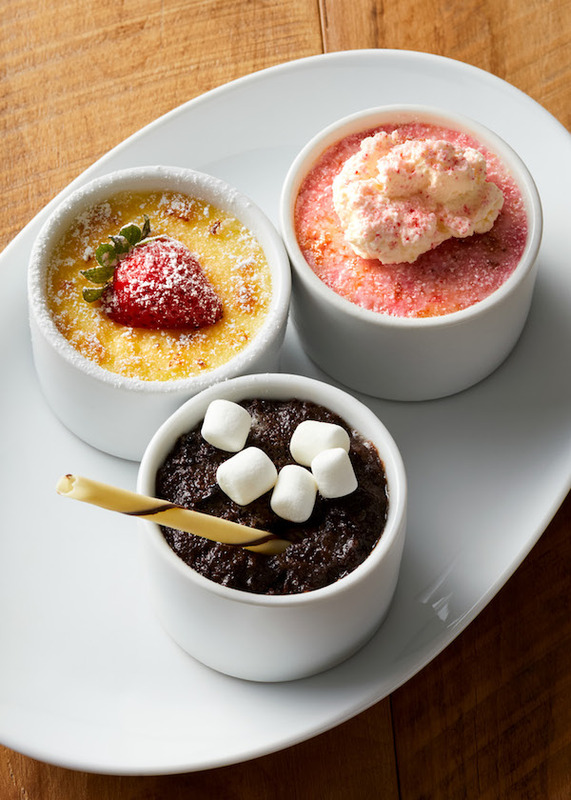 This nationwide restaurant group offers multiple locations and multiple crème brûlées. 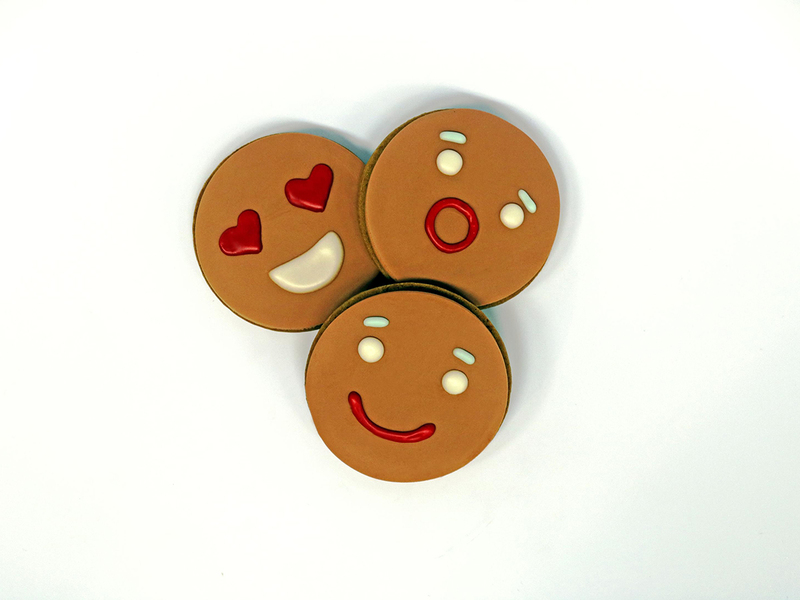 This holiday season, try three different flavors of custard, including peppermint, hot chocolate, and vanilla bean. Make a reservation at Bravo Cucina Italiana. A combination of the two greatest holiday flavors — hot cocoa and peppermint. 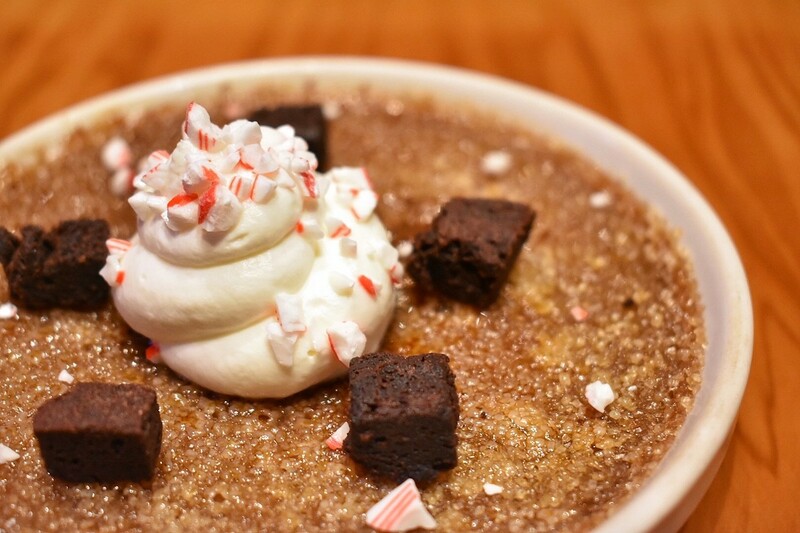 The chocolate custard is coated with crystallized caramel and anointed with peppermint whipped cream, brownie bites, and peppermint candy. Make a reservation at Wolfgang Puck Bar & Grill. 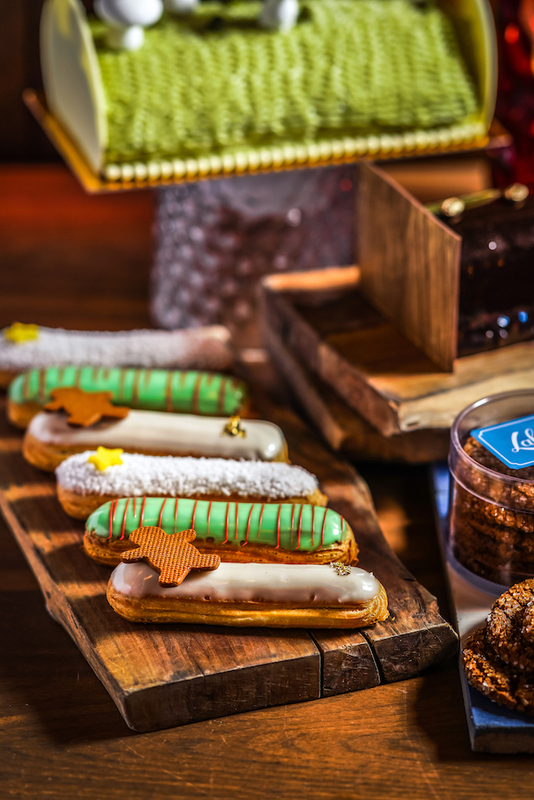 This chic Parisian style cafe celebrates the season right with peppermint eclairs. Order a cafe au lait and a minty fresh eclair or two to enjoy on the side. Make a reservation at Lafayette. An elevated version of a Thin Mint cookie. 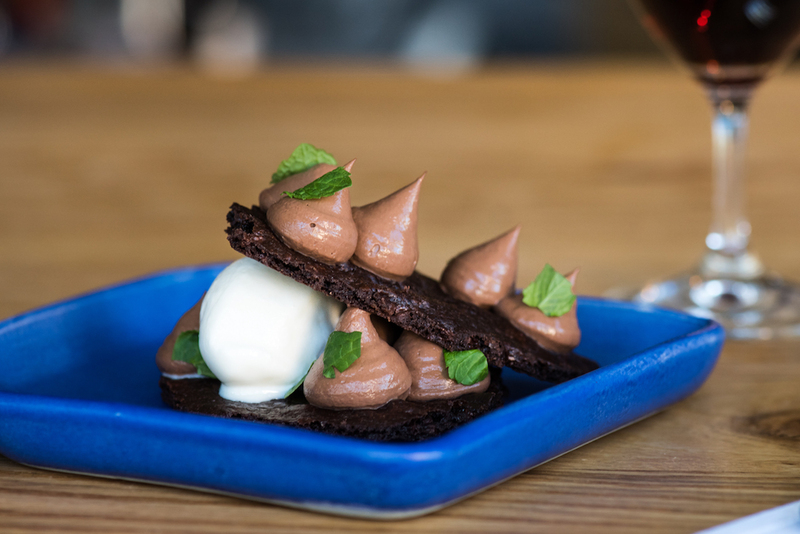 Iced milk and mint chocolate ice cream are sandwiched between two salted chocolate sable cookies for a refreshingly cool spin on the after-dinner mint. Make a reservation at Rich Table. Every year, gourmands gather round the Yule log to warm…their bellies. The celebratory cakes with a French accent are only made during Christmastime, so act quickly if you want enjoy this delicious tradition. 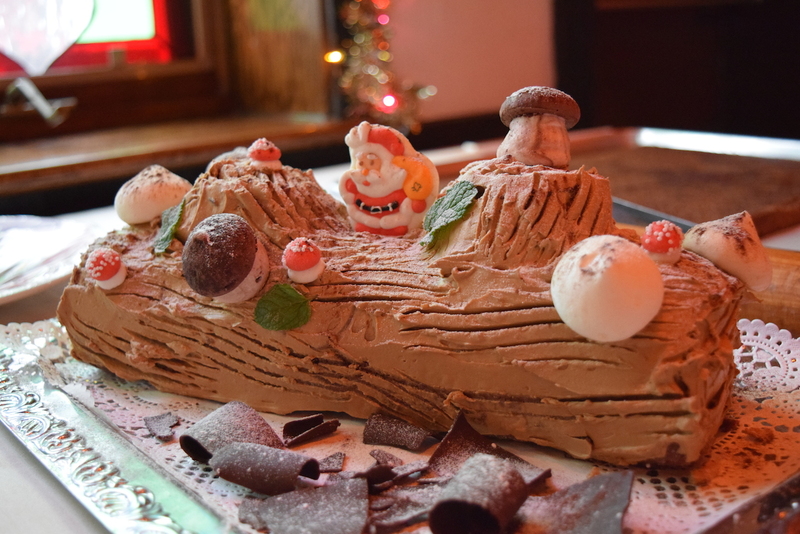 Here are 10 très bien Bûche de Noël to make your season merry and bright. 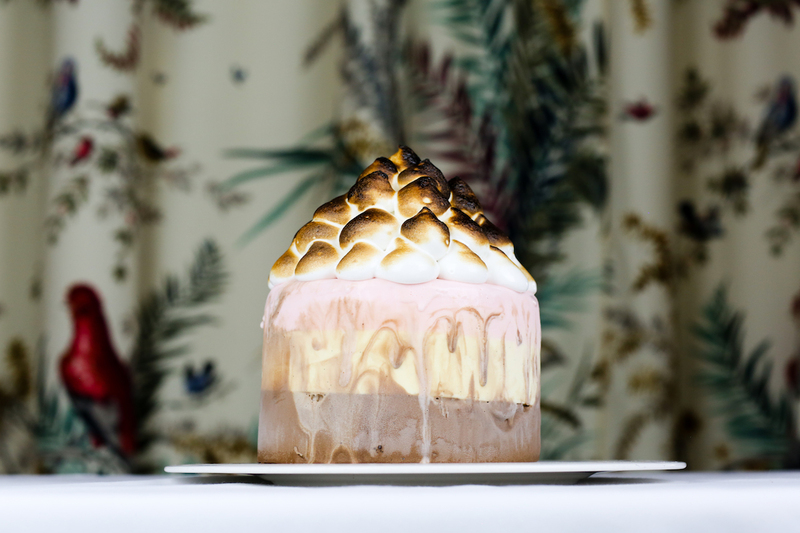 Co-owner and pastry chef Michelle Poteaux usually crafts her Bûche de Noël with dacquoise cake, but chose to use chocolate soufflé cake instead this year. 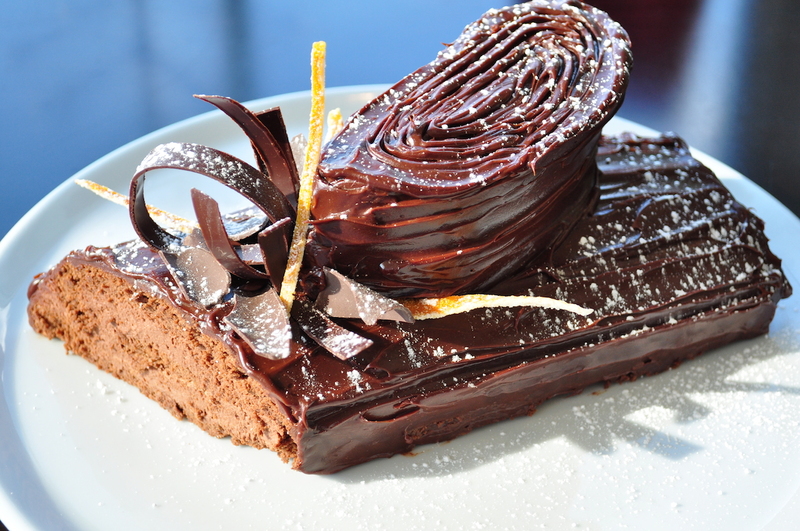 The rich, tender pastry is rolled around chocolate mousse and iced with fudgy ganache. Arcs of chocolate and candied lemon peels add festive flair. Make a reservation at Bastille. You’ve never seen a Bûche quite like this. 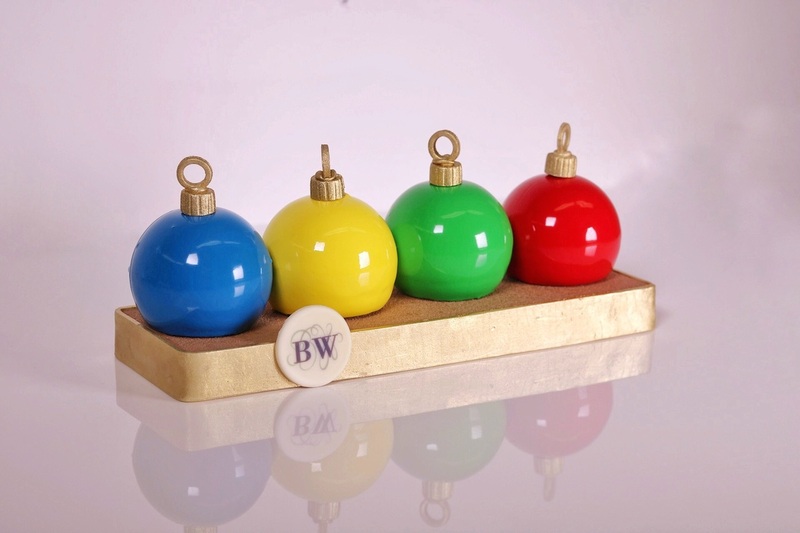 Instead of the usual log, executive pastry chef Chris Ford crafts a trio of colorful Christmas bulbs. The cheery spheres hide a delicious peppermint chocolate core. Make a reservation at the BLvd. Pastry chef Thomas Padovani didn’t want to slog through a standard log. 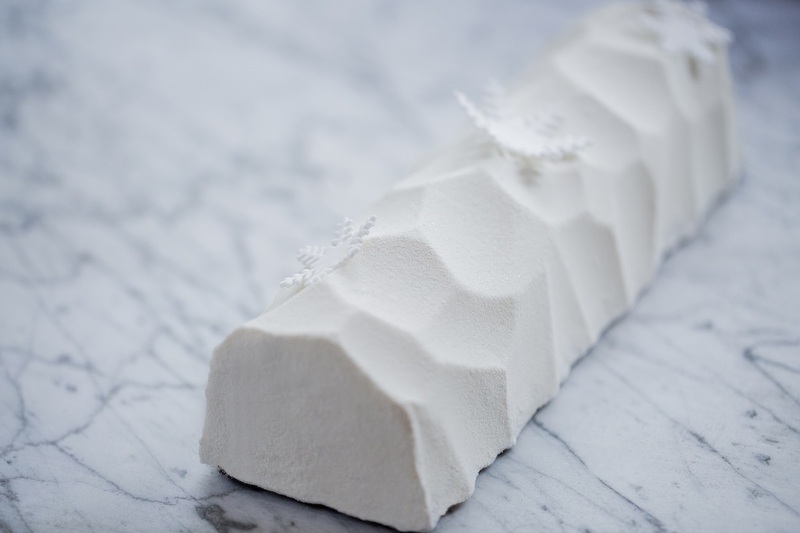 Taking inspiration from calissons – a traditional diamond-shaped French candy made from candied fruit and ground almonds – he created a modernist-minded, ivory white log that hides those flavors instead. Make a reservation at Benoit. Served only on Christmas Eve, chef Joel Guillon begins with a sheet of white génoise sponge cake, which is slathered with the guest’s choice of chocolate, hazelnut, or Grand Marnier mousse. Rolled into a log, the sweet treat is enrobed in chocolate buttercream, dusted with confectioners sugar and cocoa powder, and completed with a meringue mushroom and sprig of candy holly. Make a reservation at Left Bank Brasserie. This is what winter in Miami looks like. 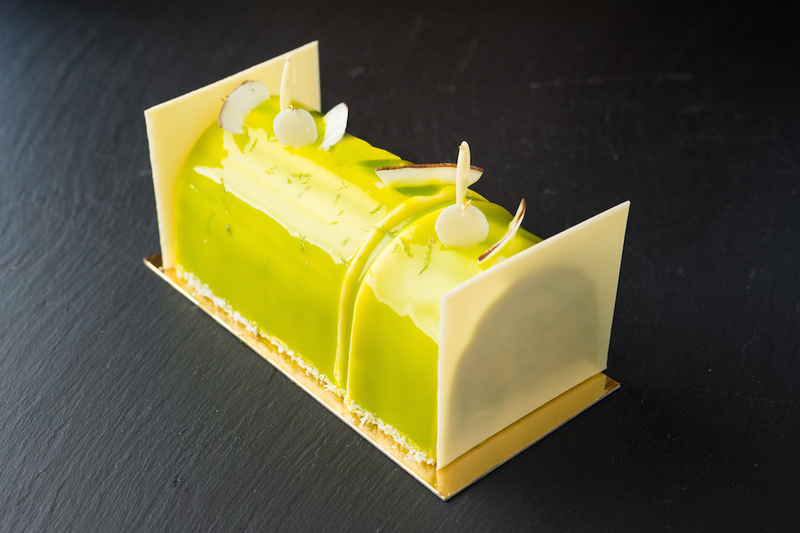 Packed with passion fruit crémeux, macadamia nuts, and pineapple sorbet, the chartreuse colored cylinder is bookended with sheets of white chocolate. Definitely not your average Bûche. Make a reservation at db Bistro Moderne. 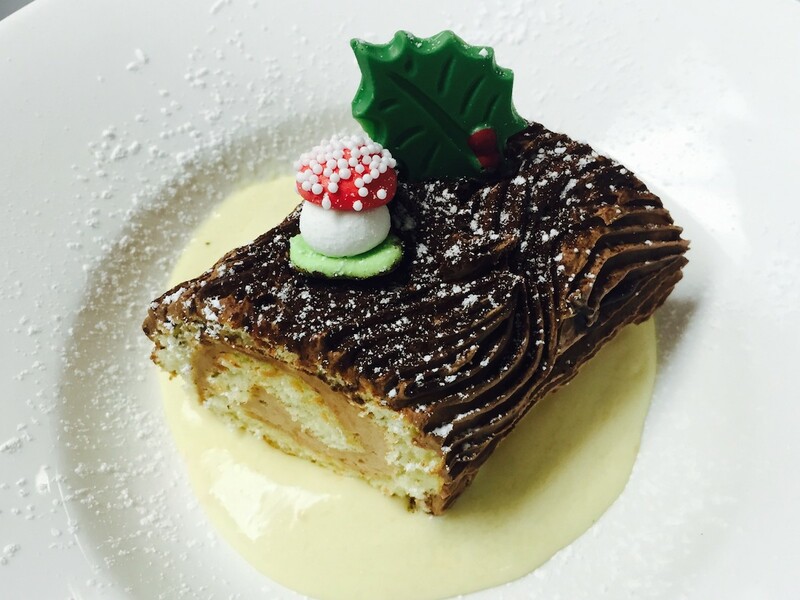 The restaurant’s founder, Franҫois Haeringer, brought the handwritten recipe for Bûche de Noël with him from Alsace when he moved to the States over a half century ago. Though he is no longer with us, his son Jacques continues rolling them out every holiday season. Chocolate génoise cake is filled and frosted with mocha buttercream and finished with a snowfall of confectioners sugar and is truly magnifique. Make a reservation at L’Auberge Chez François. Certain spices evoke certain seasons. The warming zing of ginger is always welcome in wintertime. Rather than simply bake up crowds of gingerbread men and women, pastry chefs are utilizing the zesty root in creative desserts that dazzle the palate and please the eye. Here are seven delicious ginger desserts perfect for the holidays. 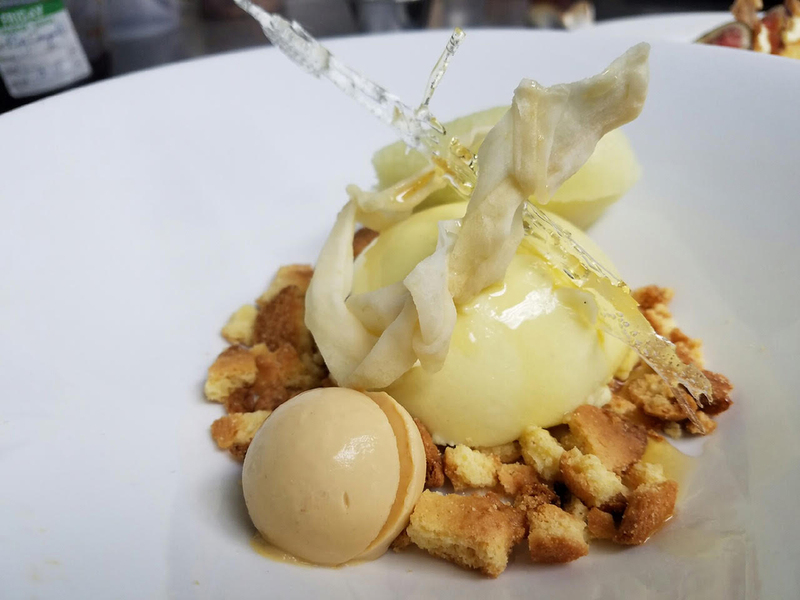 Ginger Apple Mousse Dome at Lincoln, Washington, D.C. The sweet sphere contains the spicy kick of ginger intertwined with the crisp flavor of apples. Accompanied by sour apple sorbet and a ribbon of apple tuile, it sits on a field of crumbled sablé Breton crust, which adds a soupçon of salt for balance. A forkful of all the components enjoyed together recalls a cup of mulled cider. Make a reservation at Lincoln. Warm Ginger Toffee Cake at The Hamilton, Washington, D.C.
Move over sticky toffee pudding. Instead of a traditional date cake, the pastry team features a generous disc of warm gingerbread. 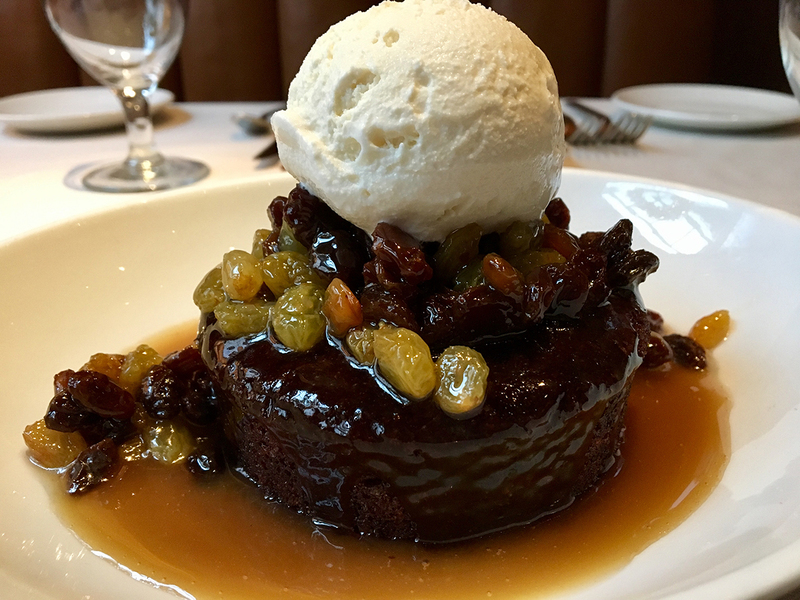 The comforting creation is topped with rum soaked raisins enlivened with a little lemon juice, toffee sauce, and a sphere of vanilla ice cream. Make a reservation at The Hamilton. This is the kind of dessert we crave when we break out our Uniqlo ultra light down jacket. 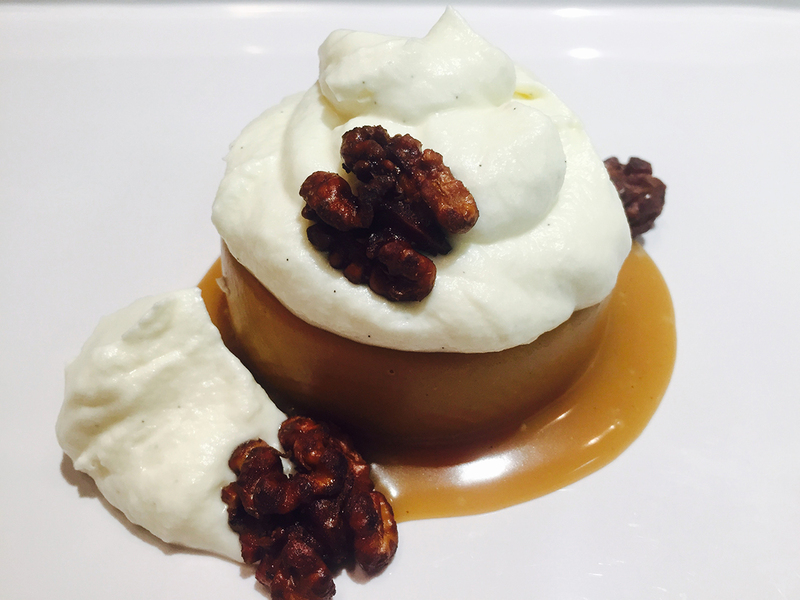 A velvety smooth gingerbread caramel custard torte rests in a tarn of butterscotch sauce, its peaks jutting into clouds of orange rum whipped cream. For a sweet and salty finish, candied walnuts complete the treat. Make a reservation at Vermillion. 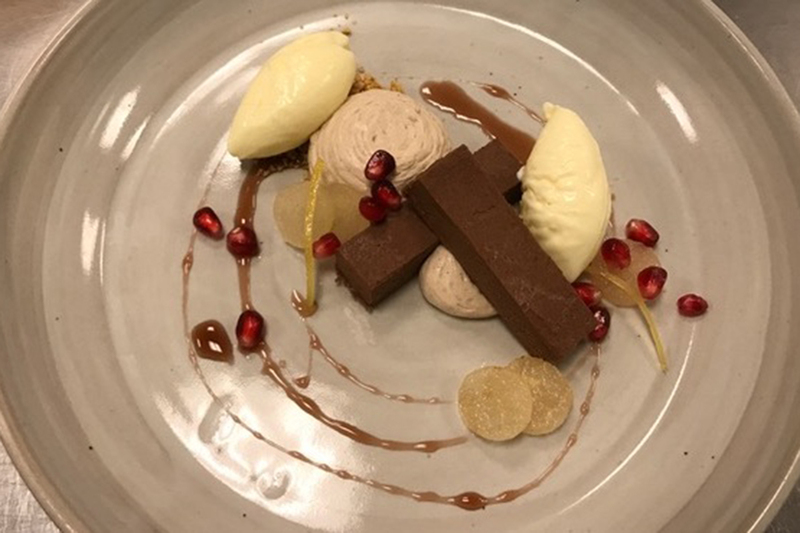 Chocolate-Chestnut Turinois with Ginger Accents at Kinship, Washington, D.C.
Ginger ice cream and matchsticks of ginger confit provide a firm counterpoint in this decadent dessert. They bring balance to the ridiculous richness of the chocolate chestnut cake – which eats like a stick of fudge – and the velveteen puffs of chestnut mousse. For flashes of fresh flavors, pastry chef Anne Specker includes disk of compressed pear and sweetly tart pomegranate seeds. Make a reservation at Kinship.    . Make a reservation at THE Blvd.